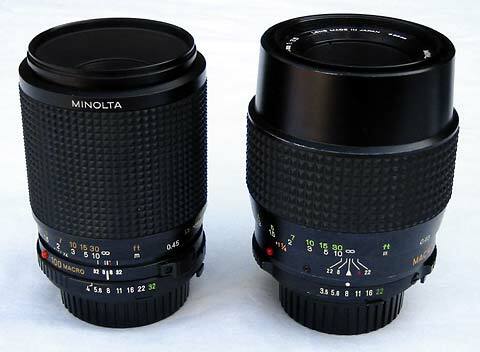 Minolta's two 100mm macro lenses. Heavy glass and steel versus a slightly slower, more compact modern design. 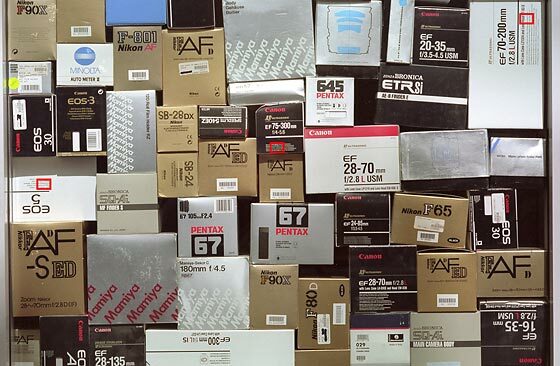 Which is the best choice for Minolta users?. When I first started building a Minolta system I was keen to get a macro lens. I am sure that many photographers have, like me, seen images of tiny insects, watch workings, and other small objects, and longed to be able to replicate that type of image. I did some research and quickly discovered that for real life photography, a 50mm macro was not the best choice. A 50mm macro is great for copy work or non-animate objects, but for insects I needed to get a 100mm macro because is enables greater working distance. But which lens to get? Excluding the 100mm bellows lenses Minolta made two 100mm macro lenses, being the earlier f/3.5 lens and a later f/4 lens. Which should I choose? 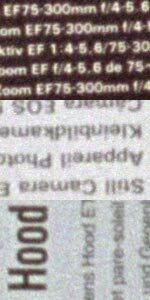 The 100mm f/3.5 Macro lens started it's life as an "early MC Rokkor" era lens (refer my Minolta lens history page for details) with a filter thread of 52mm. When the lenses were redesigned with commencement of the MC 2nd Generation the lens became a 55mm filter thread, and it assumed the basic design that would last with only minor changes up to the early MD era. The 100mm f/4 was introduced with the MD 2nd Generation, and was a significantly different lens to it's predecessor. While retaining the 5 elements in 4 groups design, the lens is remarkably different in appearance, size and most importantly weight. The f/3.5 lens weighs 602 g (1.34 lb), while the f/4 is a lightweight 388 g (0.85 lb)! The difference in size between the two lenses is very obvious in this photo. The earlier design (on the right) is much larger, presumably to hold the larger elements which give it its one-third stop improvement in speed. So which is the better lens? Well, you are not likely to get a definative answer on that subject here today. One of the things that many photographers do not realise is that there is often a large degree of difference between lenses from the same production run. This is called sample variation. Additionally, these lenses are all many years old now, and at least in the case of my lenses, they have been owned by someone else before me. As a result, the results I achieve with my lenses may be totally different from the performance you achieve with yours. The only way to make sure is to do what I do, and check for yourself. That said, the results I achieve can at least give you an idea of what to expect, and may make interesting reading . They will also provide a benchmark for when you do your own testing. If you do, and your results are significantly different from mine, please advise me. You can find my details in the 'Contact Me' section of the site. The lenses have been tested for sharpness at differing apertures, as well as bokeh, light falloff, and flare. As a result, the information below should provide a good indication of performance. Wow, don't you wish that this was your closet? So do I! It is actually the side window at my local pro shop. This series of images will give some indication of performance at normal distances. The shot was taken from a distance of about 12 feet. In the 100% crops shown below, the top image is from the centre of the frame, the centre image is from the left hand edge of the frame, and the bottom crop is from the absolute top-right corner. If you look carefully above you can see the red squares that show the actual size of the crop. The samples below are actually approximately 0.5mm x 0.7mm on the original negative. No sharpening, grain management or dust and scratch removal technology has been used for these scans, which were conducted at 5400 dpi, no multipass, 8 bit. Looking at the 100% crops above I feel that the f/4 lens marginally outperforms the f/3.5 wide open. Centre sharpness appears similar but perhaps with slightly more contrast in the f/4 sample. 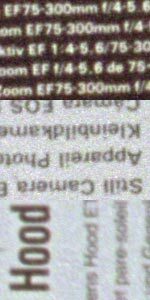 Side and corner sharpness, while absolutely outstanding in both lenses, appears to very slightly favour the newer design. What is amazing is that both lenses show this degree of detail right to the corners even wide open! The crops above show on the left a sample of white card from the centre of the image (the Canon EF 28-70mm box) together with on the right a sample from the corner (the EF 70-200mm box). The tone of the cardboard is the same in real life, and accordingly any difference in representation on the negative will relate to light falloff. Based upon the crops above it is apparent that the newer f/4 lens records significantly less light falloff wide open, when compared to the early f/3.5 design. At f/4 the lens performs astoundingly in this respect, with very nearly no light falloff whatsoever. This lens could certainly be used with absolute confidence wide open. At f/5.6 the earlier design improves its contrast, and both lenses record improvements in edge and corner sharpness. The f/4 lens still seems to me to be superior. 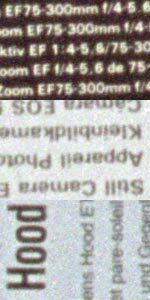 At f/5.6 the f/3.5 lens records a better result, but the f/4 design has absolutely no light falloff whatsoever. 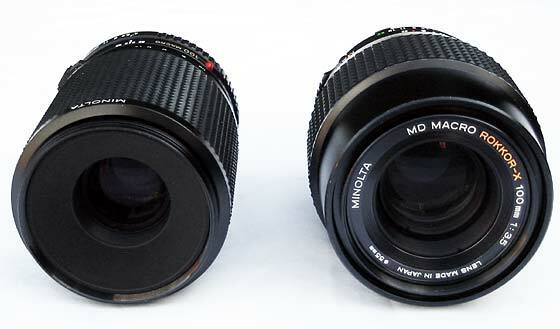 At f/8 the lenses appear virtually identical in performance. At f/8 the older f/3.5 lens still records some light falloff, however in general photography this would be barely noticable. 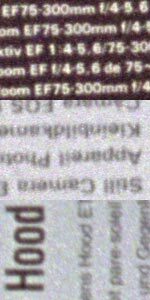 The f/4 design naturally shows no evidence of light falloff given it was not evident at f/5.6. At f/11 the first signs of diffraction are beginning to appear, and resolution has actually diminished from the f/8 samples. Performance is very similar. At f/11 the older f/3.5 lens still records some light falloff, and accordingly, given it has been closed down three stops we can assume that the lens will always record a minor level of falloff. It is noted that this is an extreme test, and in gereral photography this level of falloff would be unnoticeable.